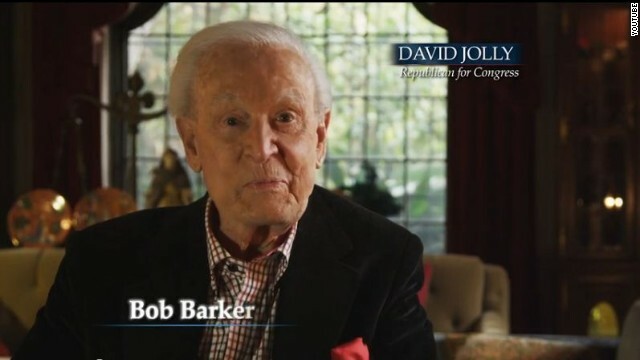 (CNN) - Bob Barker is taking sides in a Republican primary for a vacant U.S. House seat in Florida. The former longtime host of "The Price is Right" stars in a new TV commercial for David Jolly, who is running to succeed his one-time boss, the late Rep. Bill Young, who died earlier in October. In the ad, Barker, who turns 90 Thursday, says "folks, when you get to be as young as I am, you call it like you see it. That's why I'm supporting David Jolly for Congress. I admired David as he worked along my good friend Bill Young, helping wounded veterans, protecting our seniors and children, and by standing up for Pinellas (county) with character and honor." The spot ends with Barker saying "with Jolly, the choice is right." Jolly's campaign says the commercial would first run Thursday morning, during the local airing of "The Price is Right." Barker is making a cameo appearance Thursday's program to celebrate his 90th birthday. Jolly, who worked as a lobbyist, was also a longtime adviser and former general counsel for Young, who was in his 22nd term in the House and was the longest serving Republican in the chamber at the time of his death. Jolly is facing off against state Sen. Kathleen Peters in the January 14 primary. The winner will run against Democrat Alex Sink, the former chief financial officer for Florida, in the March 11th general election. Florida's 13th district, which covers most of Pinellas County and parts of St. Petersburg, is considered a swing district and the special election to fill out the remainder of Young's term is expected to be firmly in the national political spotlight. What!?! What do you mean thats how he ended that spot? He didn't say to make sure to spay and neuter your animals? I wish Bob Barker would come out with a campaign to spay and neuter liberals! Now THAT would be a public service!! Awww, aren't you so clever and witty? Did you think of that all by your widdle self? Mommy must be so proud. She called BTW and said it's time for you to get off the 'puter and do your homework and chores or no dessert for you this evening. Sorry bob, I've always liked you because of your spay and neuter much needed campaign. While I will stay on course for the animals you just lost me as a fan. You are too old. Thats why the Reps lost the election. As someone who resides in the congressional district in question, I think have a pretty good grasp of the issues and the people running for the seat. So, what are your credentials to judge us "libruls"? Have you seen all the ageist comments from leftists on here? You don't have to be a rocket scientist to recognize prejudice and all of it is coming from leftist posters. Oohh, what's that, a page and a half? Now go look at a story that is even REMOTELY associated with Obama and count the page after page after page after page of incessant racism and hatred. You want hatred and bigotry? Liberals are NOT where it's at. The truth hurts, eh Fred? Liberals are the most intolerant folks around. No secret there. Better get some bandages, Fred.